LEAP/E2020 BELIEVES THAT THE GLOBAL SYSTEMIC CRISIS will experience a new tipping point from Spring 2010. Indeed, at that time, the public finances of the major Western countries are going to become unmanageable, as it will simultaneously become clear that new support measures for the economy are needed because of the failure of the various stimuli in 2009 , and that the size of budget deficits preclude any significant new expenditures. If this public deficit “slip knot” which governments gladly placed around their necks in 2009, refusing to make the financial system pay for mistakes  is going to weigh heavily on all public expenditure, it is going to particularly affect the social security systems of the rich countries in always impoverishing the middle classes and the retired, and setting the poorest adrift . At the same time, the general context of the bankruptcy of an increasing number of states and other authorities (regions, provinces, federal states) will entail a double paradoxical event of increasing interest rates and the flight out of currencies towards gold. In the absence of an organised alternative to a weakening US Dollar and in order to find an alternative to the loss in value of treasury bonds (in particular US ones) all central banks will have, in part, to “reconvert to gold”, the old enemy of the US Federal Reserve, without being able to state the fact officially. The bet on recovery having been, at this point, totally lost by governments and central banks , this Spring 2010 tipping point is thus going to represent the beginning of the huge transfer of 20,000 billion USD of “ghost assets”  in the direction of the social security systems of the countries which have accumulated them. In GEAB N°40, the LEAP/E2020 team develops its anticipations on these various subjects, whilst also giving a detailed appraisal of its 2009 anticipations which achieved an overall success rate of 72% . Finally our researchers unveil their recommendations regarding this month in particular: commercial real estate, currencies and expatriates’ revenues. Reality quickly fuelled GEAB N°39’s anticipation which indicated that 2010 would be a year noted for three trends, one of which would be state bankruptcy : from Dubai to Greece, via more and more worrying reports from the rating agencies on US and British debt, or the draconian Irish budget and the Eurozone suggestions for grappling with public deficits, states’ increasing incapacity to manage their debts is making press headlines. However at the centre of this press ferment, all the information isn’t of the same value: certain are no more than laborious works on the “finger” of the Chinese proverb , whilst others really stretch to the moon. On the subject of laborious works on the “finger “, this public announcement of the GEAB N°40 presents the case for its anticipations on Greece. Coming now to Greece, we find a theme similar to what our team showed up in the GEAB N°33 in March 2009, when the press gave widespread publicity to the idea that Eastern Europe was going to lead the European banking system and the Euro into a major crisis. We have explained that this “news” was not based on anything credible and that it was only ‘a deliberate attempt on the part of Wall Street and the City to create the belief of a crack in the EU and instill the idea of “deadly” risk weighing on the Eurozone, in continually publishing false stories on the “banking risk from Eastern Europe” and trying to stigmatise a Eurozone cowardness compared to American or British “willful” measures. One of the objectives is also to try and turn international attention away from the increasing financial problems in New York and London, all with the purpose of weakening the European position on the eve of the G20 summit’. The Greek case is rather the same. Not that there isn’t a crisis in Greek public finances (that is the reality), but the supposed consequences for the Eurozone are overestimated, whereas this crisis indicates increasing tensions surrounding sovereign debt, the Achilles heel of the United States and Great Britain . 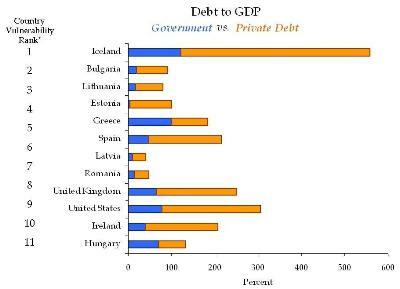 First of all, one must remember that Greece remains the country above all others, which badly managed its EU accession. Since 1982, different Greek governments have done nothing but use the EU as an inexhaustible source of subsidies, without ever taking steps to modernise the financial and social framework of the country. With nearly 3% of GDP coming directly from Brussels in 2008 , Greece is indeed a country which has been on a European drip-feed for almost thirty years. The actual deterioration in the country’s public finances is, then, only another step in this drawn-out development. The Eurozone leaders have known for a long time that the Greek problem would materialise one day. But with a country producing 2.5% of the Eurozone’s GDP (and 1.9% of the EU’s) we are far from a dangerous situation weighing on the single European currency and the Eurozone. By way of example, the California’s default (12% of US GDP) entails far more risks of destablisation of the Dollar and the American economy. Moreover, since the same analysts usually like to make lists of all the Eurozone countries facing up to a serious crisis in their public finances (Spain, Ireland, Portugal, to which we can add France and Germany), for the sake of completeness it should be pointed out that in the United States, besides the fact that the Federal State would be technically bankrupt  if the Fed weren’t printing Dollars in unlimited quantities for the purpose of buying, directly or indirectly, Treasury Bonds for an equal value, and besides California (the richest state in the Union teetering on the edge of the abyss for months), there are altogether 48 States out of 50 with growing budget deficits now . As summed up by the title of the December 14th edition of Stateline, an American website specialising in the US States and municipalities, said “Nightmare scenarios haunt the States”, all the states of the United States are afraid of defaulting on their debt in 2010/2011. The Eurozone, which has the largest gold reserves in the world , also includes countries which accumulated budget surpluses until last year, a foreign trade surplus and a central bank which hasn’t turned its balance sheet into a pool of “rotten or ghost” assets (contrary to the Fed in the last 18 months). So, if the crisis in Greek public finances clearly indicates something, it is not so much Greece’s situation or a specific Eurozone problem, but a wider problem which is going to become much worse in 2010: the fact that Government bonds are now a bubble on the verge of exploding (more than 49,500 billion USD worldwide, a 45% increase in two years ). The deteriorating ratings published by US rating agencies since the Dubai crisis shows, as always, that these agencies don’t know how to (or can’t) anticipate these developments. Let’s remember that they didn’t see the sub-prime crisis coming nor the collapse of Lehman Brothers and AIG, nor the Dubai crisis. Because they are dependent on the US government , they are unable, of course, to directly blame the two at the heart of present financial system (Washington and London). However, they show from which direction the next big shock is going to come, State bonds… and in this field, the two countries with the most exposure are the United States and Great Britain. Besides, it is very instructive to see the subtle change in the tenor of the articles published by these agencies. In a few weeks we have gone from the same old explanation stating that the intrinsic quality of these two countries’  economies and their management removes all risk of default on the part of their respective governments to a warning that, from 2010, it will be necessary to demonstrate these qualities and management skills in order to keep the coveted Triple A rating which allows borrowing at the lowest cost . If even the rating agencies start to ask for proof, it’s because things are going really badly. • it requires it to seriously consider the solidarity measures to put in place in this type of situation. The watchers are thus going to have to make a clear choice: either they treat Greece as an isolated example, or they treat it as a component of the Eurozone. But they can’t do both at once, adding the weakness of an isolated Greece to a weakened Eurozone caused by Greece. • it requires, at last, the Greek authorities to carry out an operation of « Truth » on the financial state of their country and allows the EU to push forward the necessary reforms, notably to substantially reduce endemic corruption and cronyism . • it should serve as an example to European governments (and others) who fudge economic and social statistics more and more, demonstrating that such fudging only results in plunging a country into crisis even more. Sadly, we are more doubtful on the idea that other leaders will follow the Greek Prime Minister’s example… certainly not before a change of government in Great Britain, the United States, France, or Germany. Consumption still remains lack-lustre in the United States and Europe as well (in spite of year-end celebrations). So-called Chinese growth (watch this eye-opening video by Al Jazeera on the reality behind the Chinese numbers) doesn’t even begin to stimulate its Japanese neighbour one little bit (which would have been a clear signal that there really has been a restart of the Chinese economy), requiring it to be the first major country to adopt a second economic stimulation package in less than two years (source: Asahi Shimbun, 09/12/2009). On the other hand the faking of statistics is beating all records: a “radical” fall in unemployment in the United States fed by temporary jobs related to the Christmas shopping period and a method of calculation as “theoretical” as before (source: Global Economic Trend Analysis, 04/12/2009), “Black Friday” which in fact saw the value of sales dropping compared to the year before (source: Reuters, 29/11/2009), unemployment which continues to rise, and business real-estate in free-fall in Europe (source: Les Echos, 10/12/2009, and an interesting visual stroll amongst empty office blocks in Amsterdam made by Tako Dankers, “reassuring” Chinese industrial production numbers in November 2009 since they were compared to the big fall in November 2008. Such fantastic results for the hundreds of billions of 2009 stimulus plans! 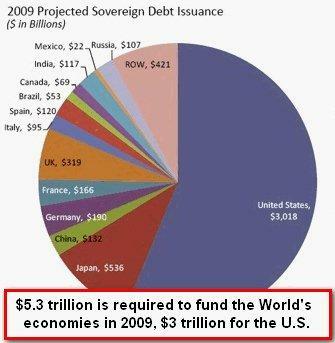 And in believing the banks who told them that saving them would save the economy. Two-thirds of the global amount estimated by LEAP/E2020 a year ago, out of which two-thirds haven’t yet gone up in smoke in the various financial and real estate markets of the world. This score is lower than the 80% of 2008 but still high, particularly for an exceptional year with regard to the unprecedented extent and number of interventions by the authorities, multiplying the factors at play. And of Japan to a lesser extent. For instance, between national central banks and the ECB, the Eurozone possesses 10,900 tons of gold and the United States only 8,133 tons (source: FMI/Wikipedia, 11/2009). Or, more precisely: the US Treasury declares that the United States holds that amount of gold, knowing that there has been no independent audit of US gold reserves for over forty years. We will return to the subject of the true amount of US gold reserves in more detail in the next edition of GEAB (N°41). Indeed our team believes that in 2010, in a context of explosion of the Government bond bubble, gold is going to become an absolute necessity for central banks. Legally and even financially speaking, see previous editions. Sometimes we see the wildest surrealism in reading the views of these agencies.